If you take all the past and present generations of input devices and incorporate them into virtual reality, you suddenly being to realize just how rich in possibilities the technology really is. A Wii fit board (remember those?) can double as a skateboard for future Tony Hawk titles, while various other companies are incorporating gloves and ‘armor’ for haptic feedback and tracking. Startup VirZoom uses a custom-built stationary bike, and various other groups are experimenting with wearables as a futuristic mode of interaction. One university graduate even designed an experience involving Google Cardboard and several oddly shaped lollipops—when combined, wearers step into the shoes of someone with autism as they try to communicate with those around them. Physical props and devices can generate intensely immersive and real experiences, whether you’re walking on a VR-ready treadmill or simply using a Vive or Oculus touch controller. 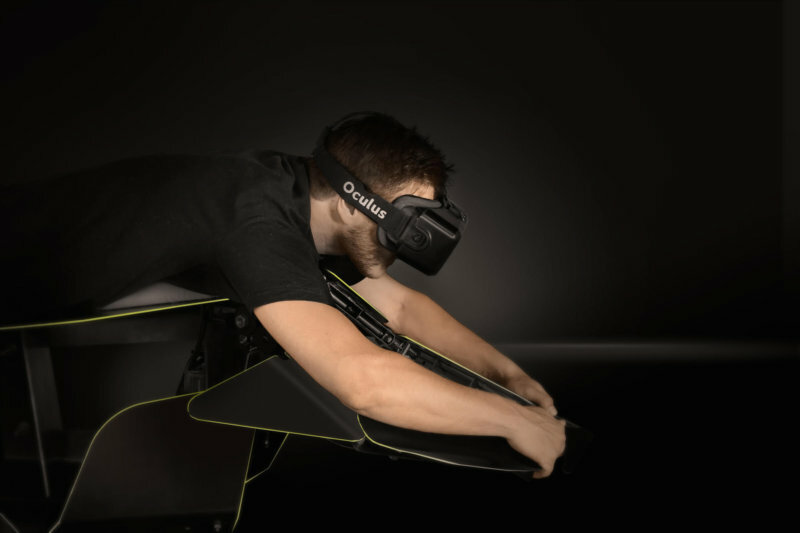 In the case of one of VR’s crazier stunts, an exoskeleton-like suit has you laying flat on your stomach while it fastens to your forearms, quite literally giving you wings. Still in its prototyping phase, the Hypersuit is being built by a Paris-based startup, and was showcased in this year’s CES conference. The suit is designed to fulfill mankind’s ‘oldest dream’ of flying, while simultaneously offering a fresh take on a VR controller. Whereas most experiences ask you to sit down, Hypersuit asks you to flap your arms to fly as a bird would. “The difference between a game controller and our project is that with the Hypersuit your whole body is the joystick, so you can move freely like Iron Man instead of using your thumbs,” founder Gregoire Arcache told VentureBeat. With Hypersuit, content creators can turn you into a scuba diver, astronaut, wingsuit flyer or superhero. The getup is outfitted with a number of sensors that detect movement; everything else, including the hardware and software that syncs to a headset, is still in the works. The company hopes to ship its product in June, however not much is known regarding which stage of development it’s in or what the price will be. Currently, the four-man team is self-funded, but plans to start getting some backing in February.